“What’s my favorite G Suite for Education tool?” asked a Google Educator Level 1 session participant. “Google Slides. You can do so much with it!” said another. Slides offers many exciting features that make it a versatile assistant for educators. In this blog entry, let’s take a look at five Google Slides hacks you may find useful. These may deepen your appreciation for Google Slides and increase your productivity. 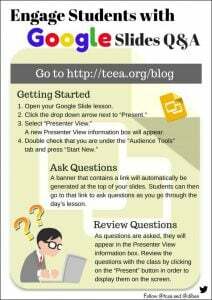 Note: Curious about what else TCEA bloggers have shared about Google Slides? Explore this rich collection of suggestions, handy tips, and more. “I’m so tired, today felt like being stuck in a crossfire hurricane,” said a friend. At the time, I missed the reference. Classrooms can be tumultuous. The right slide deck can dazzle, amaze, and engage learners of any age. Many agree that a potent message is key. The TED Talks blog lists ten tips worth reviewing. The fifth tip from that list provides our first hack. “Use photos that enhance meaning,” says Aaron Weyenberg (Director, TED). That seems obvious, right? Aaron encourages us to focus on message first, then to select images that enhance. When I create my Google Slides, I find myself crafting my message and looking for images at the same time. Aaron’s more measured approach involves finding images AFTER the message. Let’s say that you have gathered your images into a folder. Now you have ahead of you the repetitive task of inserting those images and adding words. What if there was an easier way? Store images for an upcoming presentation in your Google Drive folder in JPG, PNG, or GIF format. 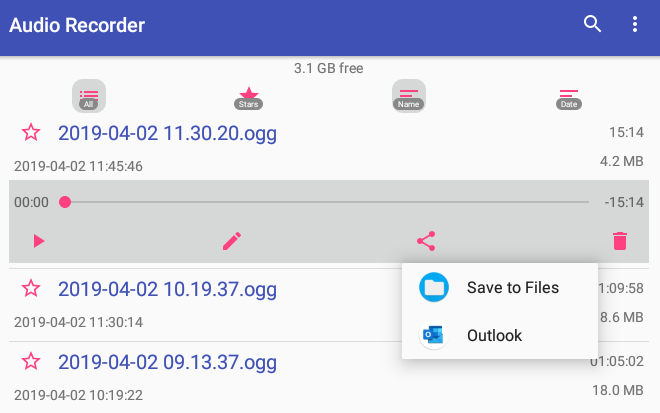 Open your images folder in Google Drive. Click the DriveSlides icon. You will see several prompts to click through (most about permissions). 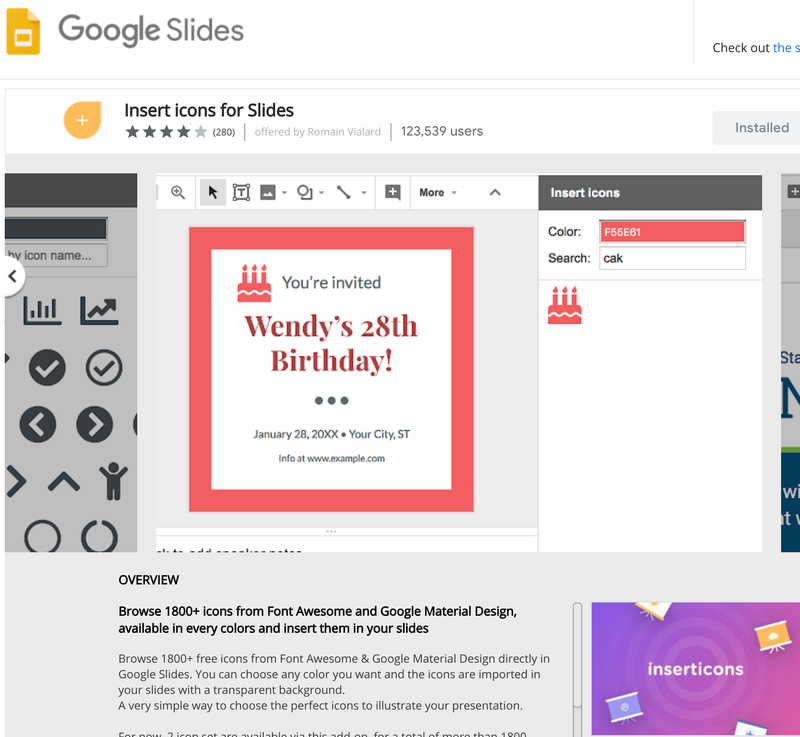 DriveSlides will create a Google Slides slidedeck, inserting your images for you. Customize your Slides slide deck theme, shuffling slides with pre-loaded images around. One observation I made while DriveSlides worked: I had named each image (e.g. Slide 1, Slide 2) with a vague hope. The hope was that DriveSlides would place the images in the order I wanted. That’s not the way it worked. The image placement on slides appeared random. One of the creators (Alice Keeler and Matt Miller) of Drive Slides has made a video walkthrough. Check it out. “Why don’t you attend Dale Carnegie’s public speaking workshop?” suggested my dad. He had seen my last presentation, one where I felt compelled to read from my notes. A short time later, at seventeen, I put Dale Carnegie’s presentation strategies to work. With those strategies in mind, I thought I had to present without notes. Of course, I was wrong. In time, I learned to rely on slide notes. You can, too. When presenting now, I use a combination of engaging images that trigger my memory. Slide notes assist me when trying to remember key facts, research, and details. Use slide notes in Google Slides to assist your memory. SlideSpeech: It converts your slide notes into audio narration for each of the slides. This narrated slide show is available for viewing via the SlideSpeech mobile apps. Auto Resize Speaker Notes: Allows you to resize the slide previews. To do this, resize the Speaker Notes or selec a size via the sidebar. See the effect of auto resize in the image below. Explore how you can use speaker notes to provide instructions to students. Did you know you can dictate text into Slides’ speaker notes section? This could be a time saver for you rather than typing up everything you know. 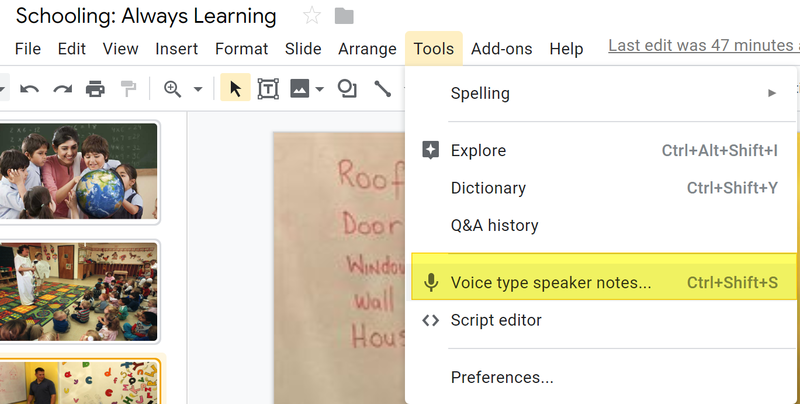 Use voice typing (Go to Tools then select Voice type speaker notes). Use voice commands to edit and format your text. Adding speaker notes has never been easier. Give it a try! 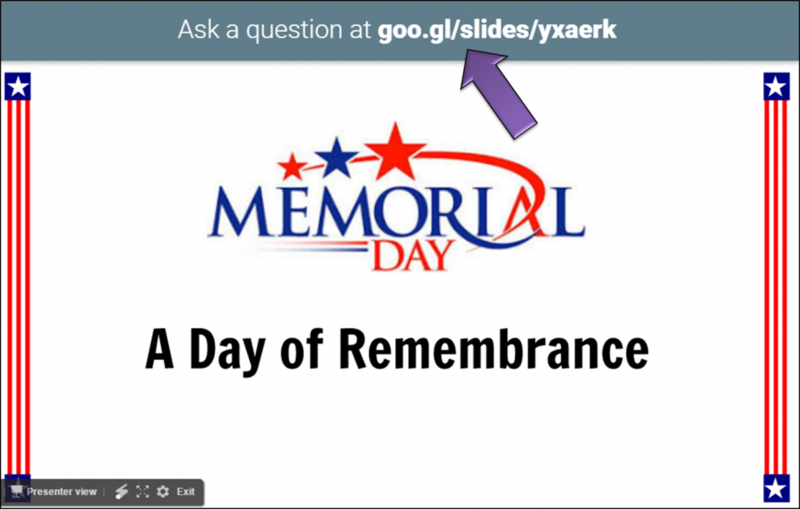 Did you know you could create a hyperlinked slideshow? This is a slideshow for which you have created some form of navigation. Navigation might appear as a table of contents that you click on to jump around the slide deck. Eric Curts (@ericcurts), Control-Alt-Achieve Blog, shares a rich variety of examples. You can find my curated list online. Want some different examples? Check out Rex Threatt’s interactive worksheets video tutorial. Hoping for a classroom application? 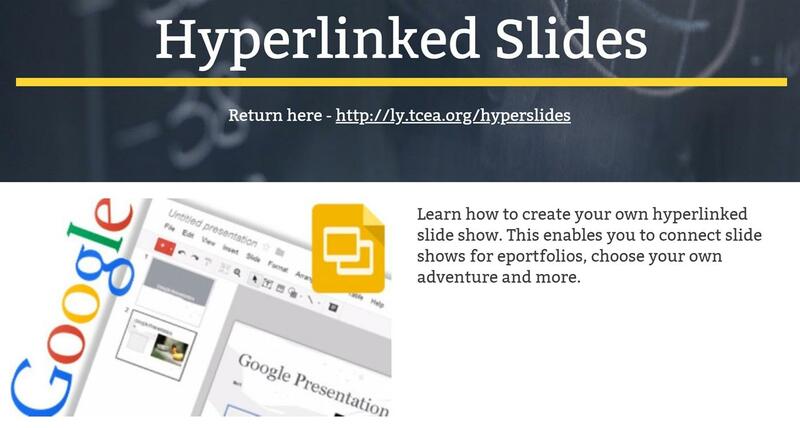 Aside from choose your own adventure or interactive worksheets, consider the use of hyperlinked slides as an easy way to create self-guided presentations a la hyperdocs. Find more ideas. One of my favorite PowerPoint features enables me to insert audio recordings. In Google Slides, the only way to put audio in was to insert a YouTube video. 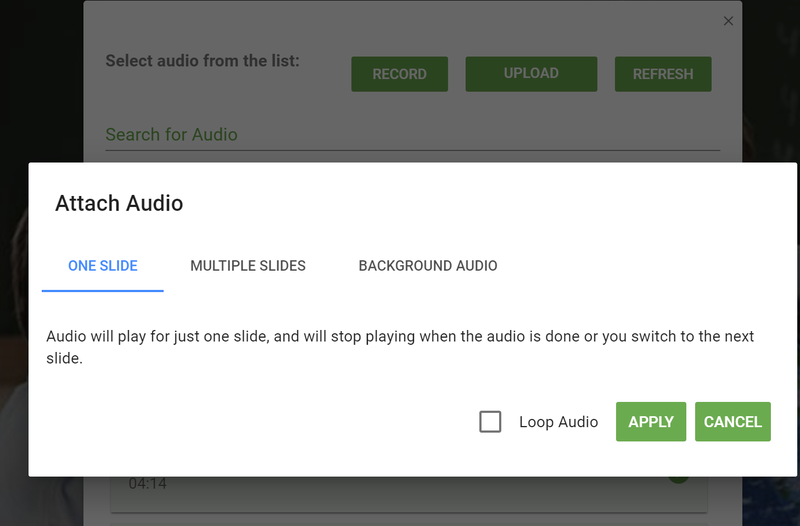 With the Audio Player for Slides, you can insert audio per slide. 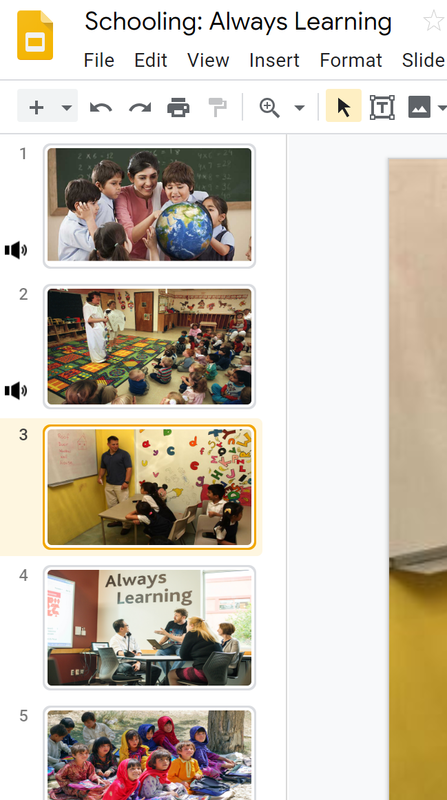 As you can see from the screen shots below, you can add audio to each slide. 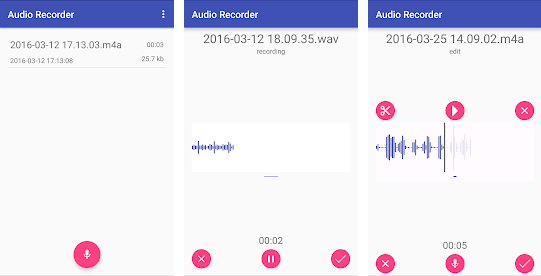 Put your audio files in MP3 format in Google Drive. A quick classroom application? Ask students to add audio reflections that explain a slide; this can boost classroom learning. These Google Slides hacks depend on a few Chrome extensions. Give these a try to make how you use Google Slides more engaging. And, since you’ve stuck this long with this blog entry, why don’t you give the Insert icons for Slides add-on a try? You get 1800+ free icons you can use in Google Slides. Closed captioning can also be a game-changer for educators in the classroom. Closed captioning can help meet different students’ learning styles. It will also support your students who are second language learners. And of course, always providing access for students with disabilities is a must. Therefore, check out the steps below in order to use closed captions with your Slide presentations. Your microphone needs to be on and working in order to use captions with Google Slides. 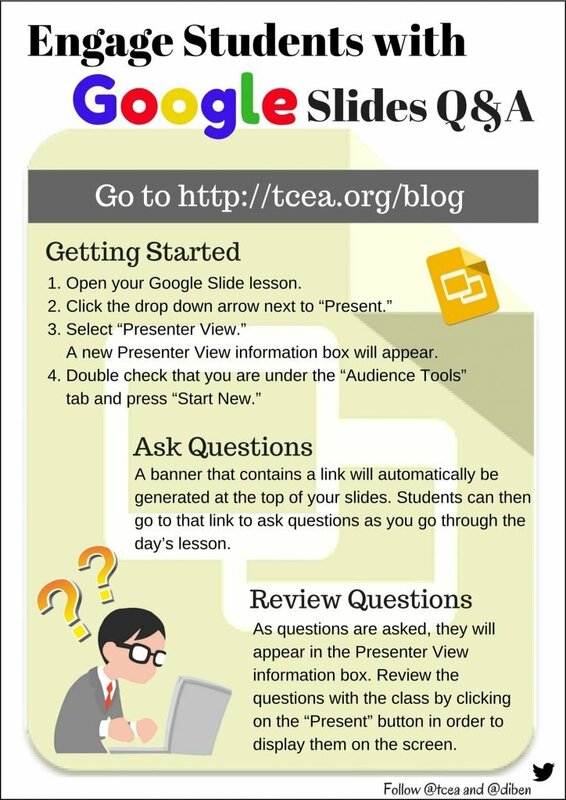 Open your presentation in Google Slides. You must be using the Chrome browser on a Mac or PC. To start presenting, click Present. Click CC to turn on captions. You can also use the shortcut Ctrl + Shift + C in Windows or Chrome OS, or the Command key + Shift + C if you’re using a Mac. Begin speaking. As you speak, captions will appear at the bottom of the screen. Note that captions don’t include punctuation and are not stored. To turn off captions, click CC. The captions are powered by machine learning. They are heavily influenced by the speaker’s accent, voice modulation, and intonation. Currently, Google Slides close captioning only supports English. However, Google hopes to expand the feature to be available in other languages soon. Before you begin using closed captions, you might want to let your audience know beforehand. Google recommends asking your audience for their preference before enabling captions. Some people find them more distracting than helpful. It’s also worth noting that captions and your microphone automatically turn off if there’s no activity on your computer for 30 minutes. Put simply, closed captions has many benefits for everyone. When presentations are accessible to learners of all abilities and learning styles, everybody wins. Give it try! Back in April, 2016, I wrote about my first efforts with infographics for the art-challenged. Making infographics using Microsoft PowerPoint and Google Slides has gotten easier. In this blog entry, you will find a variety of take-and-make infographics templates in Google Slides, which means you’ll be able to make copies of the Google Slides templates you like. Microsoft user looking for Powerpoint templates for infographics? Here are over 15 templates to get you started. Let’s take a closer look at what one of the expert infographic construction spaces, Venngage.com, has to say. The folks at Venngage.com have created a gallery of infographics illustrating the different types of infographics. How cool is that? You can read The Top 9 Infographic Template Types. Their template gallery is quite inspiring. 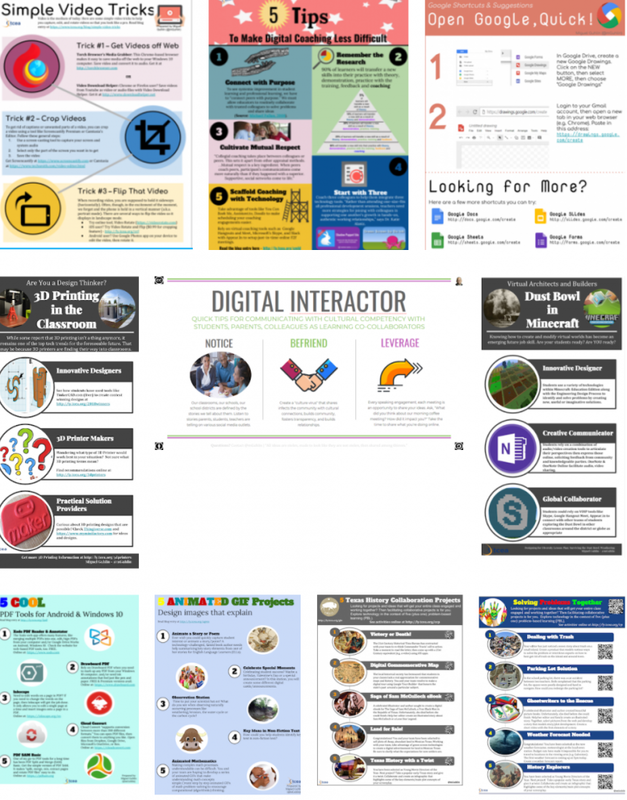 Below, you will find some of the infographics adapted from ideas they inspired. As I explored their template gallery, I decided to see if I could remix the look of an infographic into a Google Slides or Drawing. Some of my early infographics were made with PowerPoint. The tool you use is up to you. Deconstruct these to use with students. Explore some of my infographics below. Can you guess which were my first attempts at an infographics? One of the hardest things for a non-artist is to match the colors; read this Canva blog entry. The more you play with Google Slides, the more fun it is to use the tools to get results closer to the high bar folks like Venngage.com and Infogram.com set. Here are a few creations; get them all online. Wait, May I Have a Copy? Get your own copy of all Google Slides/Drawings infographic templates at “Infographics Made Simple” site. You will be making your own adaptations of these templates fast. Check the IMS site for new creations. If you are a student using G Suite for Education, you may be unable to access the Google version of these infographics. That’s because your school district has NOT allowed you to access resources outside of your school district domain. Get a teacher to access the resources here, then share them with you using your school district domain. OR, use a personal Gmail account. “Infographics are a visual representation of data. When students create infographics, they are using information, visual, and technology literacies,” says Kathy Schrock. As I developed the infographics shown above, I gained a deeper appreciation for how to place images, match colors, create shapes. A more important lesson included how to select information and data to share. What a valuable lesson for creatives (like our children) to learn. If you are hesitant about starting with infographics, recognize that sites like Venngage, Piktochart, Canva, and Ease.ly have a rich library of templates you and your students can draw inspiration from. Get started with these free take-and-make infographics templates in Google Slides. “Storytelling is one of the ways we connect with other people, allowing us to share our hopes and dreams, our fears and worries, and our experiences and plans,” says Lori Gracey in her blog entry, Telling Our Stories. Presentations are opportunities to show people different ways of thinking about a topic and to tell a story. How you structure your presentation impacts how people receive your perspective. Let’s explore a few tips to create fabulous presentations with Google Slides. Tip #1: Enthrall listeners with powerful narratives. “It is more difficult to process information if it is coming at us both verbally and in written form at the same time,” says Garr Reynolds, author of the Presentation Zen book and blog. A stirring story well-illustrated can make it easier for your audience to process information. Avoid bulleted lists, lots of text, fancy and transitions and animations. These just get in the way of the story you are telling. Charts are fine to include when they align to the story you are trying to show and tell. Tip #2: Engage with pictures. “Pictures should contain the story within a frame,” suggests Tatjana Soli in The Lotus Eaters. This isn’t a bad approach when selecting pictures that capture the flow of your narrative. Once you have crafted an enthralling story, you need pictures that illustrate each well-defined idea or concept. The simpler the image, the more impact it can have on the viewer. 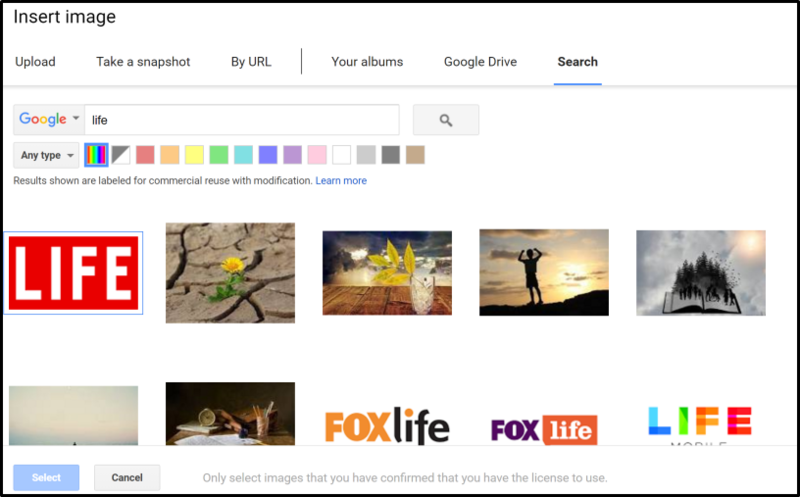 You can upload (put) your own picture; grab a snapshot if on a device equipped with a camera; paste in the URL (web address) to a picture you have found online, in your albums, or on Google Drive; or take advantage of Google’s Image Search. Notice that the results shown are labeled for commercial reuse with modification. 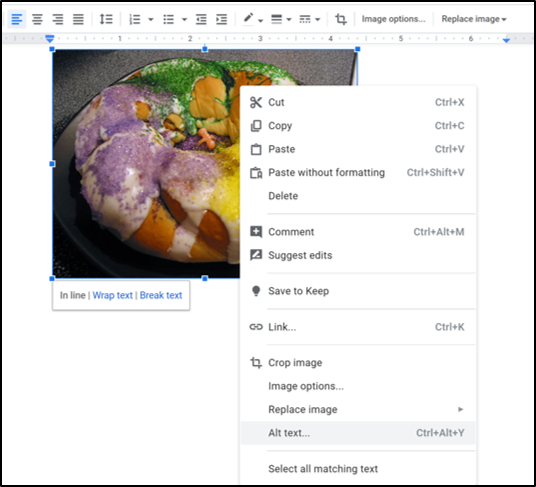 You can also reshape images in Google Slides using the Crop tool. Simply select the desired shape. Tip #3: Enhance experiences with multimedia. You can enrich user experiences by adding multimedia. 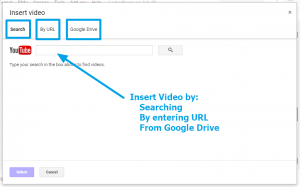 Google Slides allows you to embed videos from YouTube, as well as any videos you may have stored in Google Drive. The latter option makes it easy to insert audio files that have been saved as MP4 files. These MP4 files have audio, but no video, and can provide an emotional touch or enhance an image. Navigate to the non-YouTube MP4 you want to insert in your Google Slide. Use an image or text item to serve as the hyperlink to the MP4 file. To play the MP4 file, click the hyperlinked image or text. Read this information from Google for an illustrated how-to. Tip #4: Enchant the eyes with fonts. Step 1 – Go to the Font Drop Down Menu and Choose MORE FONTS at the bottom of the list. Be brief and use large font sizes with only a few words on the screen. Vary colors of your font text to match the theme of your slide show. Tip #5: Enlist the help of available slide templates. Are you stuck for a creative look to your slide theme? Then check out this blog for some amazing templates that can serve as your starting point or an inspiration for what you want to create yourself. 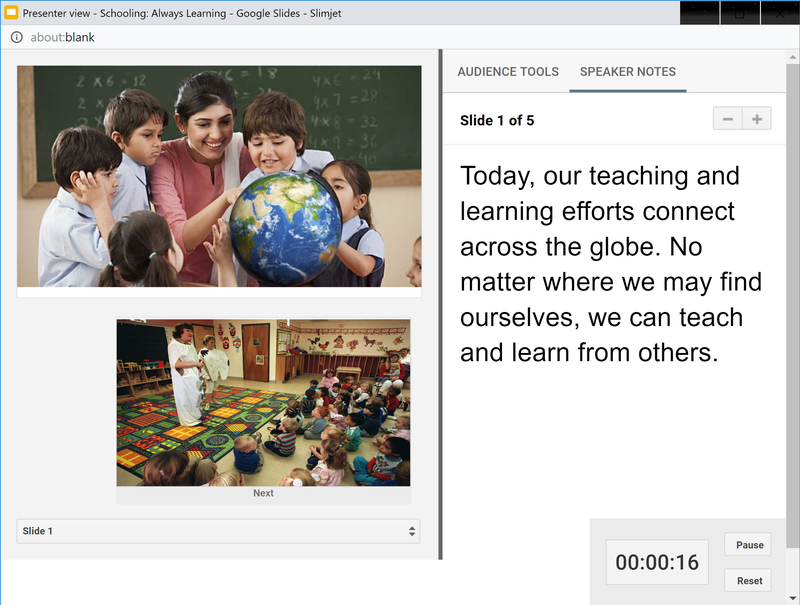 Last year, Google announced a new feature for Google Slides, Slides Q&A. The feature allows for more interaction, as well as real-time feedback, and is fabulous for both classroom and professional development use. By simply submitting questions from any device, students can now be more engaged and directly involved in lessons. Click on image to download poster. Select “Presenter View.” A new Presenter View information box will appear. Note that a banner that contains a link is automatically generated at the top of your slides. Students can now go to that link to ask questions as you go through the day’s lesson. Furthermore, students can also vote on the questions asked if they have the same question or feel like it was a good question to ask. In addition, if your students are logged in with their Google account, their name will appear next to their question. As questions are asked, they will be sent in real time to the information box that appears. Most noteworthy, you have the option to present the questions on the screen by clicking on the “Present” button. This is perfect for doing whole-class review. As a result of using Google Slides Q&A in the classroom, there are several vital implications for you and your students. Students are more engaged because they can actively participate in the lesson. Students who don’t want to speak up in class now have a place to ask questions. Teachers can see which questions students have that are similar by having students vote on questions they want answered. Students can ask questions immediately as the lesson is being delivered. Teachers are able to address questions immediately while going through the lesson. Slides Q&A is such an easy feature to use with so many benefits. If you haven’t tried it in your classroom, I challenge you to do so. It’s a great way to get your students actively engaged! If you’re like me, you are not a graphic designer. I have no eye for color and no sense of what does or doesn’t look good. Therefore, my presentations can sometimes be either boring, because I’m afraid to use a provided design, or horribly garish as I create a background that is downright ugly. What I really like about these templates above others I’ve seen is the fact that each one comes with a great explanation of the thought process behind the colors and fonts selected. This is a fabulous way for someone like me or your students who have no experience in design to get a better understanding of how professionals put together a blended look. Each template also comes with not just a “front” slide, but up to 25 different slides built around that particular design theme. You can download the set as a PowerPoint slide and then upload it to Google Slides or export it in PDF or JPG formats. New templates are added monthly and they also offer a “template of the month” that fits a theme for that time of year. So be sure to revisit them often. If you or your students are in need of graphic organizers that help them to complete projects (and not just slide backgrounds), you can find them in this blog post. Of course, you can’t go wrong with these from Google itself. While they tend to be more content specific (science project, student certificate, status report), there are some nice designs available. And this is a fabulous virtual museum template from David Lee that would be great for a student project. This is a good Google Slides design for schools. It downloads as one presentation, but includes a variety of template choices in it. 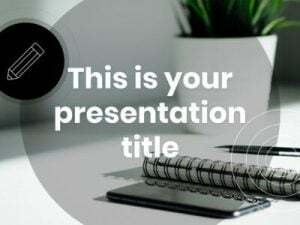 The same company offers this free open book presentation template, an orange presentation, a blue origami business background, and a creative banners one on black. They also provide a very nice gradients background that can again be used to help students discover what makes a graphically interesting and alluring template. Digital Graphic Design teacher Mike Macfadden created these Google Slides designs for his students to use and also shares them with you. There are currently 15 of the simple but effective templates available. Presentation Magazine has a lot of very nice PowerPoint templates available for free download. Of course, these can be downloaded as a PPTX file and then converted to Slides. There are some well-designed templates for Google at Slide Model. They lean toward business presentations, but could be used for other purposes as well. Our blog about even more free templates! Finally, once your students have investigated the world of design, they may be ready to create their own masterpieces. Alice Keeler offers a nice how-to article on creating presentation templates in Google Slides. This blog was updated on October 11, 2017 to include more free templates. If you want to see templates for students to use in Google, check out these. Or join us for our monthly free-to-members Google webinars that will have you creating and looking like a pro. 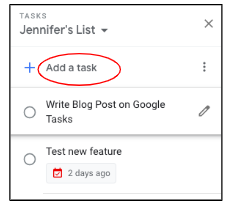 I did a happy dance last week when Google announced they were adding some additional functionality to their Tasks App. I think I’ve mentioned it before, but I am not a list maker. It’s not that I don’t make lists. I do. But I don’t use them daily to organize my time. Making lists is really more of a technique for me to brainstorm things I need to get done. Instead of using a list to organize my day, I use my calendar. If I need to do a task, like writing this blog, I block off time on my calendar to accomplish that task. 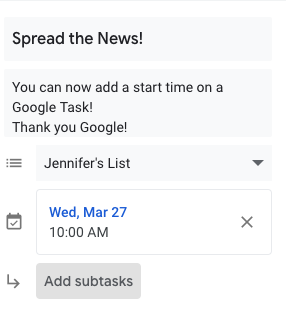 This is why, up until now, I rarely used the Tasks App in G Suite. Before this week, the Tasks list has been just a list. You could assign a date to a specific task, but not a specific time. 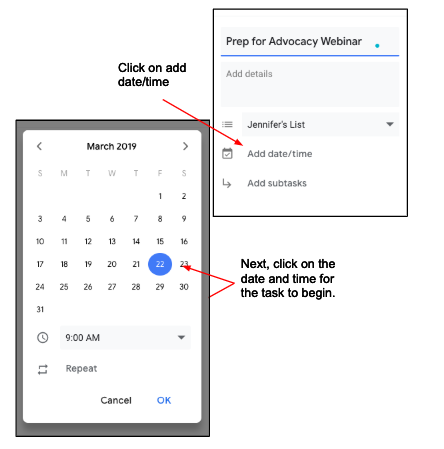 This meant the task would be viewed in the small space at the top of your Google calendar if you had your Task Calendar turned on. However, you could not assign a specific time of the day to work on the task. Now you can! Let me show you how. 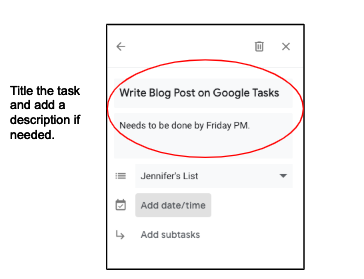 You can get to your Tasks in your G Suite Apps such as Gmail, Drive, Slides, and Calendar. They are located in a small pane on the right-hand side of the app. 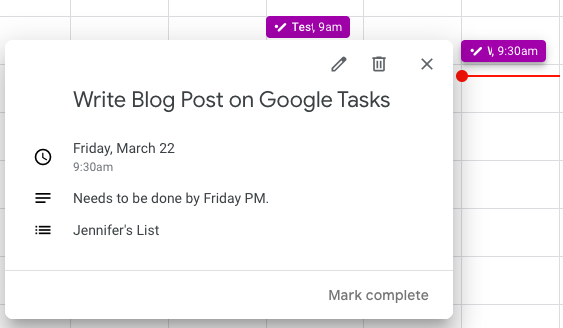 You want to click on the Tasks icon to open up the side panel to add a Tasks list. Then click on Add a task. This opens up the panel for you to add or edit a task. The next step is pretty simple. You can even set this task to repeat from this window. This would be useful if it was a task you had to do every week or month at the same time. The only thing I have left to show you is where to find this on your calendar. 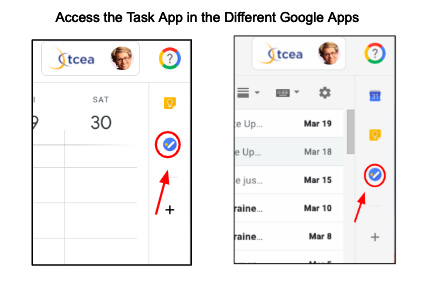 You may not realize this, but you have a Tasks Calendar. You must turn it on in order for you to be able to see your tasks in your calendar. 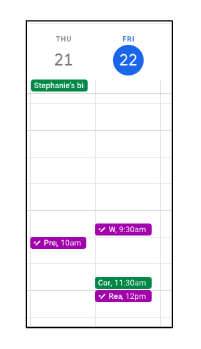 Once the Tasks calendar is made visible, you can now see your tasks on your Google Calendar. The entries in purple are on my Tasks calendar. 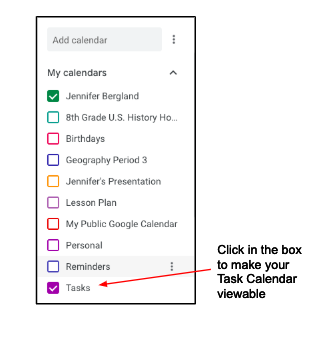 You can click on the small entry in your calendar to see the details of the task. Remember, anytime you want to edit a task, hover over it and click on the pencil. Now, I do have one more thing to ask Google. Please add the ability to designate an end time for the task. This would allow me to have the best of both worlds. I can create a list when I am brainstorming what I need to get accomplished and, at the same time, schedule my time using the Task list. I love that I can designate a time to begin the task, but I want the ability to also designate the time I should finish the task. 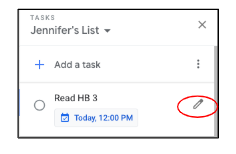 If for some reason I am not finished with the task, I can go back into the task and edit the time and date so I can schedule another block of time to work on the task. Thanks, Google, for making my day, but I’m counting on you to finish the task! As educators, there are many things we can do to make our Google Docs more accessible to our students. We should always be thinking about including Universal Design for Learning (UDL) in all that we do. 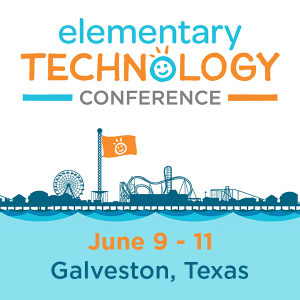 As a matter of fact, the ISTE Standards for Educators call for educators to design authentic, learner-driven activities and environments that recognize and accommodate learner variability (ISTE Standard 5, Designer). Check out the best practices below to create documents that will be more readable and accessible for everyone, including your students. Make it easier for others to read your document by including headings. Documents organized to include headings will help readers jump to different sections in your document. Structure and properly formatted headings are very important so that your documents can be easily understood and navigated. Besides that, no one wants to read a single long document. Headings should be selected based on their hierarchy in the document. Usually, you start the document with a heading that describes the overall document, which would be Heading 1. Follow it with a sub-heading, which would be Heading 2, and so on. Any heading style will help those who use a screen reader to navigate through your document. Select the Styles drop-down menu, located to the left of the font drop-down menu or go to Format, Paragraph Styles. Change from Normal Text to Heading 1, Heading 2, or Heading 3, using the appropriate heading levels for your content structure. An added benefit of using Headings is that they can be used to automatically generate a Table of Contents or bookmark items in your document. Images can play a significant role in Google Docs. The way to make them accessible is to add Alternative Text, or Alt Text, to the image. Alt text for images is vital to ensuring that users with visual impairments have access to information included in these visuals. Alternative text should provide enough information so that users who are unable to see them are still able to understand what they convey. Upload or insert the image. Click and highlight the image. Right click on the image and select Alt text. In the pop-up window, enter a description of the image into the Description field. While there are no hard and fast rules for determining what alternative text should say (it depends on the image, its context, etc. ), one simple trick is to imagine describing the image to someone over the phone. You can make your Google Docs even more accessible by improving how you use hyperlinks in your documents. Hyperlinks should be embedded in text that makes them clear, concise, and meaningful in context. Users visually scan pages for links to help them find the information they are looking for quickly. Those who use screen readers can pull up a list of all the links on your document at the touch of a button; therefore, the links should make as much sense as possible. Highlight the text you want to make into a hyperlink. Right click on the text and scroll to Link. Color in your documents is very important. It is critical that the appropriate contrast exist between the text in your document and the background of your document. Lightly colored text should have a darker background and darker colored text should have a light background. In addition, color alone should never be used to emphasize items on your document. Use color plus bold to highlight items. Always remember, what you see may not be what others see. As we head into the future, it will be more important than ever to consider accessibility and UDL principles. This means we must rethink what we are doing and how we are doing it. 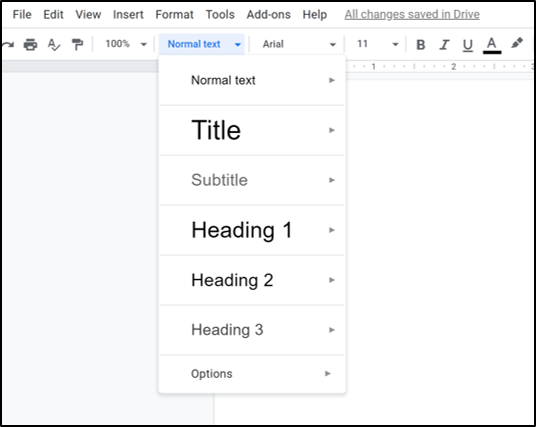 Incorporating these best practices will result in more accessible and usable Google docs.